Discussion in 'Badminton Rackets / Equipment' started by mikomi, Apr 10, 2016. I couldn't find any Gosen Fan Club thread, so here's one. This is translated from the Gosen 2016 Japanese catalog. There might be differences for the versions sold outside of Japan, but from what I've seen it seems to be more or less the same. I'm not affiliated in any way with Gosen. I was just bored with insomnia so I just wrote this thread up. Plus, we can't just have badminton revolve solely around Yonex, Victor, and Lining. Noteworthy: These Customedge rackets are the 2nd generation, hence the Version 2.0 designation. The Version 2.0 rackets are quite different from their previous generation counterparts, so please be aware when shopping for Customedge rackets that there is a distinction. 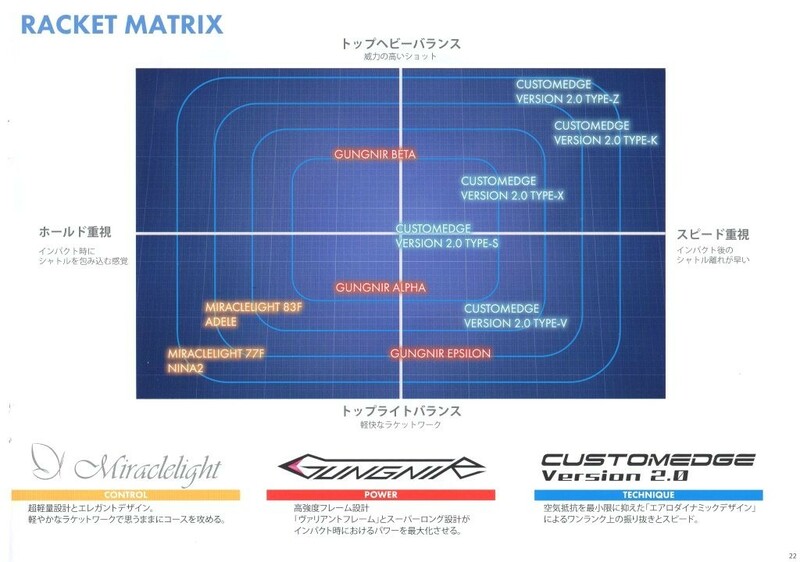 Customedge, Gungnir, and Miraclelight in a single chart, click for full-sized image. The Gungnir and Miraclelight charts are further down in separate posts. I had to move them down when I encountered an issue. Sealman, GOSEN.AU.MSO, kwun and 1 other person like this. I should also add the Customedge and Gungnir racket matrix here. GOSEN.AU.MSO and mikomi like this. I'll start with my review of the Gungnir Alpha and Beta from late 2015. The specs and subsequent playing reminded me very much of other low swing weight mid stiff rackets like ArcFB 5U, NR700, and BS12. Cycril, GOSEN.AU.MSO, Fidget and 1 other person like this. I just realized I didn't include any max tension information (because the catalogue doesn't mention them) but I don't feel like redoing the chart.. again. Updated all the charts. If there's any missing information, please let me know. And I also added the racket matrix to the 2nd post. visor, we share the same penchant for stiff, balanced rackets. What is the "rather hard" stiffness of the Gungnir Alpha like? mybadmintonstore describes the stiffness as medium. So is the Alpha a piece of rebar? Or is it an overcooked noodle? Here are the Gungnir racquets. The Alpha and Beta were released a year ago. 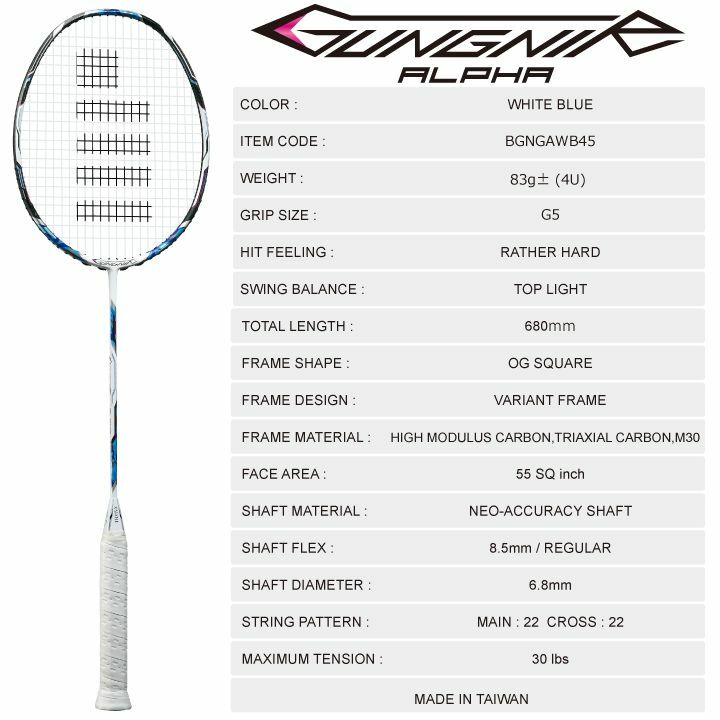 The new Gungnir racket for 2016 is the Epsilon. The Miraclelight are aimed squarely at ladies. I wonder if they are any good. But more importantly, who comes up with these name for rackets? The Gungnir chart is not right. And can you also add the shaft diameter data from the following to the charts. Tks! can you also add the shaft diameter data from the following to the charts. Tks! Oh. Oops! Fixed and updated everything. Having spent time working on the charts, the Type K v2.0 has caught my attention. I wonder if it plays anything like a JS10? Another racket I want to get now. But on simply dry swings, it's slightly head heavier and slightly flexier and whippier... but dang! It cuts through the air even faster than JS10, if that's even possible! Sounds like a functional version of the 3U JS10. I can also believe the speed. I feel the Customedges I have cut through the air better than the BS12 and JS10. While the Type K v2.0 makes me think JS10, the Type S v2.0 makes me think BS12. So I also want to get that one. And since I plan to get the Type K v2.0 and Type S v2.0, I should also get the Type Z v2.0. You hear that Gosen? I'm gonna get your rackets, so you should make me your spokesperson! Sounds like a functional 3U version of the JS10. Yep, more user friendly, but too much for me for doubles, maybe singles is fine, and not sure if the greater flex will affect accuracy. Here are the specs of my Type K and Epsilon samples. And Alpha and Beta. The Epsilon's BP is 300mm dry? Isn't that considerably off from the head light rating? Is it going to be like the JS10 that has a high BP but doesn't feel head heavy in actual practice? Gosen sure does have a lot of confidence when it comes to racket weights. They give a specific value and from what I've seen, the real-world numbers aren't very far off. Good news, found Gosen information in English. Gosen Australia (http://racquets.gosen.com.au/). Although their Customedge info is for first gen.
Yeah, I don't know if it's sample variation or what. But in two days time, I'll know a bit more of Epsilon and Type K vs my go-to Alpha. The Alpha to me so far has the most perfectly synergized shaft stiffness for its head wt. Its bending and unbending characteristics are perfectly in tune with my swing style. And the extra 5mm length helps more than one would think. 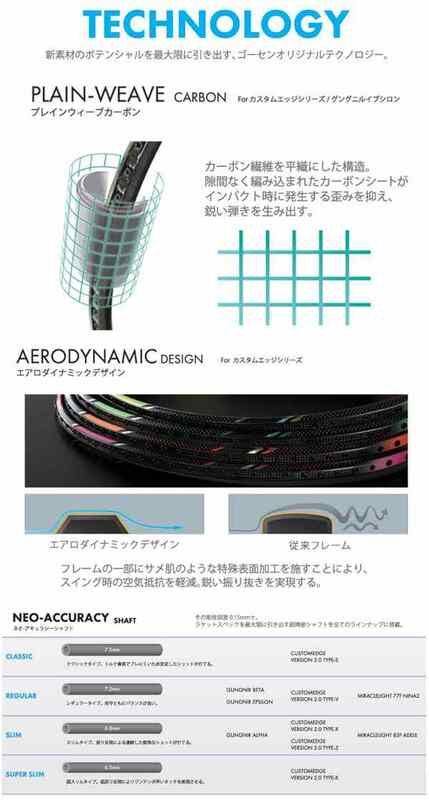 And it's aerodynamic shape cuts through the air with amazing head speed faster than any BS rackets I've tried. What the synergy means is that with my usual counter attacking play style and my usually compact swing, I can generate comfortably easy power (one of my measures is the deep backhand clear) while still maintaining accuracy in counter drives etc. Where I think I want it to go is where it goes. Previously I had MX80 and JS10 which are very stiff and I totally enjoyed the incredible accuracy for a time, but alas age and shoulder overuse made them too demanding. MX70 and JJS were not much different, MX60 and MX90 were too flexy with head lag. Similarly from the BS line, BS10 and BS15 were too stiff, and BS12 and BS11 had serious head lag issues for me. RKEP XP70 filled the gap for me for a while, but I'm sure glad the Alpha discovered me and literally fell into my lap. kwun and Fidget like this. Anymore thoughts on how the Epsilon differs from the alpha and beta?